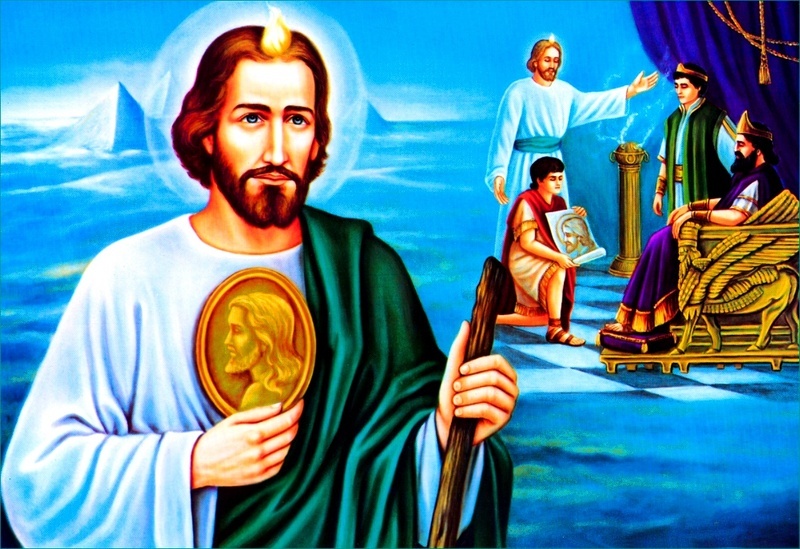 St. Jude was one of the 12 apostles hand-picked by Jesus, as well as a cousin of Jesus (Matthew 13:55). He was also the brother of James the Less, the first Bishop of Jerusalem. St. Jude is known as the Patron Saint of the Impossible, because his New Testament letter stresses that we should persevere in difficult circumstances, just as our forefathers have done before us. St. Jude is also quoted in the Bible, in John 14:22, asking Jesus why he won't manifest himself to unbelievers after the resurrection. After the death of Jesus, St. Jude traveled in Mesopotamia and Armenia. He suffered a martyr's death while being beaten unmercifully, and then having his head shattered with an axe. Martyrdom was referred to by Jesus as His baptism, in Luke 12:50. Jesus told his apostles, including St. Jude, that they would also drink from the same cup as Jesus, and receive this "baptism" of martyrdom, in Mark 10:39. St. Jude knew this, and boldly preached the Word of God to unbelievers anyway. Jude 1:18-19: they said to you, "In the last days there will be scoffers, following their own ungodly passions." It is these who set up divisions, worldly people, devoid of the Spirit"
If this sounds familiar, it is. Just look at all of the proud atheists, pornographers, and hedonists publishing books these days about how lust is natural and good, how God is not great, and how Jesus Christ married Mary Magdalene (He wasn't divine, but she was because she married Him..Huh?). Just tune in to your TV Channel during Easter and Christmas for all of the alleged "History" about the "historic Jesus" in the Common Era (instead of Anno Domini, the Year of Our Lord) and how miracles of the Old Testament were really just caused by coincidental winds, comets, asteroids, and earthquakes, independent of God. Yes, that particular end-time prophecy of St. Jude has certainly come true in these days. "Now I desire to remind you, though you were once for all fully informed, that he who saved a people out of the land of Egypt, afterward destroyed those who did not believe. And the angels that did not keep their own position but left their proper dwelling have been kept by him in eternal chains in the nether gloom until the judgment of the great day; But when the archangel Michael, contending with the devil, disputed about the body of Moses, he did not presume to pronounce a reviling judgment upon him, but said, "The Lord rebuke you." But these men revile whatever they do not understand, and by those things that they know by instinct as irrational animals do, they are destroyed." just as Sodom and Gomorrah and the surrounding cities, which likewise acted immorally and indulged in unnatural lust, serve as an example by undergoing a punishment of eternal fire.Yet in like manner these men in their dreamings defile the flesh, reject authority, and revile the glorious ones. Notice also in the above Word of God that practicing homosexuals and the lustful who do not repent before death do not get a pass. The Holy Catholic Church, under the power given to it by its Head, Jesus Christ (Ephesians 5:23), to bind and loose anything on earth, has given St. Jude the title of Patron Saint of Impossible Causes. Jesus Himself said that whatever the Church binds and looses on earth will also be bound and loosed in Heaven (Matthew 16:19). Therefore, we can be assured that asking St. Jude to intercede for us in things that we deem to be impossible, whether it's recovery from an illness, losing weight, getting a relative back into the church, etc., is something that has been ratified in Heaven by God. Please consider a prayerful gift to one of these three, ESPECIALLY if St. Jude has answered some of your prayers. St. Jude, glorious apostle, faithful servant and friend of Jesus, the name of the traitor who delivered your beloved Master to His enemies has caused you to be forgotten by many. But the Church honors and invokes you universally as the patron of hopeless cases, of things despaired of. Pray for me who am so miserable. Make use, I implore you, of that particular privilege accorded to you to bring visible and speedy help where help is almost despaired of. Come to my assistance in this great need that I may receive the consolation and help of heaven in all my necessities, tribulations and sufferings, particularly (make your request) and that I may praise God with you and all the elect throughout all eternity. I promise you, 0 blessed St. Jude, to be ever mindful of this great favor. I will honor you as my special and powerful patron and encourage devotion to you.